Update: The US Consumer Product Safety Commission (CPSC) has announced an official recall of the Galaxy Note 7, affecting about 1 million devices. The recall is for Note 7s sold prior to September 15, which will no doubt impact usage of the device. According to the CPSC, Samsung has received 92 reports of overheating Note 7 batteries, including 26 reports of burns and 55 reports of property damage. Replacement phones will be available in US stores no later than September 21, Samsung announced. Samsung is taking a beating for its massive Galaxy Note 7 recall. It's hard to ignore reports of phones exploding, and yet it appears Note 7 owners aren't deterred from using the device. In fact, the needle has hardly moved on usage rates from before the recall till now, according to data from Apteligent. "The adoption abruptly halted after the recall as retailers stopped selling the phones and Samsung activated an exchange program," writes Apteligent CEO Andrew Levy. "However, it appears that the usage rate of the phone among existing users has been almost the exact same since the day of the recall." Image credit: Apteligent | Note 7 use remains stable, even after the recall. It's been almost two weeks since Samsung issued a worldwide recall of its Galaxy Note 7, giving affected users plenty of time to send back the defective devices. US users can either exchange their Note 7 for a Galaxy S7 or S7 Edge, or get a loaner phone while waiting for a Note 7 replacement. UK users won't be getting loaner devices, as Samsung advises using a previous phone while waiting for a replacement. Samsung isn't the only one warning Note 7 users to return their phones as soon as possible. 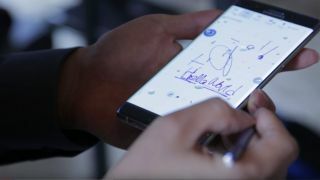 Multiple government agencies, including the Federal Aviation Administration and US Consumer Product Safety Commission (CPSC) urged Note 7 users to stop using the device. More recently, the New York Metropolitan Transportation Authority urged passengers to turn their Note 7 off before riding its buses and trains. As a temporary solution, Samsung is preparing a software update in South Korea that would prevent recalled Galaxy Note 7s from charging beyond 60%. This would in theory prevent the device from heating up and causing an explosion. However, Samsung doesn't have any plans to release the update in the US, according to The Wall Street Journal. It's understandable that some users may be reluctant to send in their Note 7, especially if it's the only phone they have. We rely heavily on our smartphones for everyday tasks, but risking injury from an exploding battery just isn't worth it.